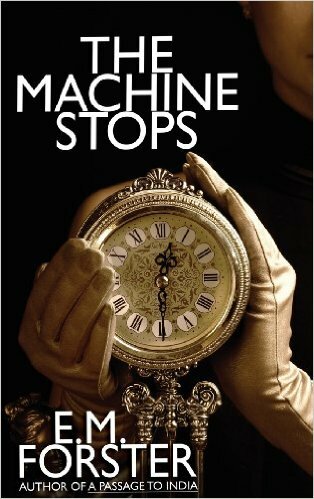 E.M. Forster’s The Machine Stops is an extraordinary short story that was decades ahead of its time. Written in 1909, the author paints a picture of a far future human society. Humanity has retreated underground. People spend almost one hundred percent of their time isolated in their personal rooms. A worldwide mechanical contrivance, known as “The Machine,” runs everything. The society is dystopian. Real human connection and interaction, critical thought and connection to nature are non-existent. People are beginning to worship The Machine like a deity. Transgressions against the system are punished by death. Vashti is a woman who happily abides by society’s dictates. Her son Kuno is a rebel who challenges the system. Among other things, he secretly and illegally visits Earth’s surface. This tale is so prophetic that it bears noting just how accurately Forster predicted certain aspects of our digital age. What contact there is with other people is accomplished through a system that is amazingly like today’s Internet. This system relies heavily upon video conferences and applications that resemble email and instant messaging. People spend much of their day chatting with one another using these mechanisms. "all the accumulations of the last three minutes burst upon her. The room was filled with the noise of bells, and speaking-tubes. What was the new food like? Could she recommend it? Has she had any ideas lately? Might one tell her one"s own ideas? Would she make an engagement to visit the public nurseries at an early date? - say this day month. It bears repeating that this story this was written in 1909. Several themes permeate the story, including the dangers of technology, loss of the ability to think critically, loss of humanity’s connection with nature and Forster’s seemingly universal concern with the issue of human connections. I have read Forster’s Howards End, A Room with a View (my commentary on this work is here ) and A Passage to India (my commentary on this work is here). These three novels all concern themselves with people bridging the gap between intellectual, social and cultural differences. Forster is a champion of people of differing groups reaching out to one another. At the same time, all of these books emphasize how difficult such connections can be and how they can even endanger individuals. Thus, it is no surprise that Forster delves into this concept within his science fiction tale. At one point, Vashti becomes infuriated when another woman, in an attempt to help her avoid a fall, touches her. One would expect a nightmare world created by Forster in such a place where even this simple human shared experience is forbidden. I highly recommend this story. As I alluded to earlier, in terms of technology, Forster was uncanny in his prediction of the future here. In addition, though his theme of human connections is a common one, he approaches it within this tale in a unique and interesting way. Finally, this is just an interesting story that is well worth reading. Lately, the issue of criticizing religion has been a hot topic. On one extreme are those who want absolutely no critique of religious belief and or holy books whatsoever. On the other extreme are those who are tying criticism of faiths to their own brand of bigotry and vitriolic language. Of course, there are many folks in the middle. In particular, the criticism of Islam has landed itself into the midst of this. All belief systems need criticism, including those that I hold dear. For instance, I tend to champion secularism, the scientific method and democracy, to name a few. I not only accept that these things will be criticized, but I understand that such scrutiny helps improve these thought systems. Ideas and ideologies can thrive as a result of being exposed to criticism, scrutiny and even parody. This allows invalid ideas to be discarded, paves the way for ideas that need improvement to be modified, and illuminates the strength of really good ideas. Religious belief is no exception. It is vital that in a free society, folks discuss and debate ideas. Religion touches upon our world in so many ways and must be included in the debate and discussion. When a belief system is not open to criticism, it creates all sorts of problems. First, if I were to accept that religion should not be criticized, than I would logically insist that a whole range of other beliefs that I cherish, should also not be criticized. In addition, when folks commit irrational or immoral acts in the name of the religion, a prohibition on criticism removes the ability to examine the motivations as well as to fully expose these actions. Ironically, though I am a nonbeliever and I often argue that we need to be free to criticize religion, I often find myself praising it as often as I disapprove of certain aspects of it. I also prefer, but do not insist, that criticism be polite and sensitive to the feelings of reasonable believers. This is not just because I like to be nice. When people’s thought systems come under scathing attack, they become understandably defensive. In addition, a one-sided view of religion, its history and how it motivates people to act does not seem reflective of reality. There is a lot of good motivated by and done in the name of religion. There are worthwhile ideas and concepts that come out of it both historically and in our present day. I wrote about the need to have a balanced view on these topics in more detail here. 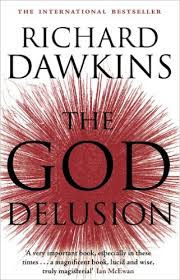 I would be remiss if I did not mention a group that is called the “New Atheists.” Richard Dawkins is the most prominent of this group that includes Sam Harris, Daniel Dennett and others. This group uses strong rhetoric and has little respect for any religious ideas. Though they seem careful not to attack individuals, their commentary on religion is often scathing. Though I agree with much of what they say, I find that not only is their tone too harsh for my taste, but that their view of religion is too lopsided, never emphasizing the good that comes out of it. There are also those who go well beyond this group. Social media is full of people who express biting hatred of religion. Sometimes this hatred is paired with racism. Nevertheless, in a free society, such voices will inevitably speak, and unless they are calling for violence, they should not be censored. Just because speech is permissible does not make it right. I support reasoned criticism of all belief systems. I also like to be respectful unless a belief is hateful or promoting discrimination or violence. With that, I also think that parody as well as harsh criticism is often in order. This is especially true when the subject is murder, violence, brutality, discrimination, etc. that are driven by the things written in holy books. Simply put, there are abominable things in both the Old Testament and the Koran. The fact that these holy books also include a lot of good things does not alleviate the need for scrutiny. As of late, Islam seems to be at the center of this debate. There has been very harsh criticism of that belief system lately. There has also been outright hate, bigotry and violence directed at Muslims. There has also been lots of fair and reasoned criticism that has unfairly been labeled “Islamophobia.” Maryam Namazie, a critic of extremist violence and mistreatment of women in Islam, has been exposed to caustic verbal attacks and harassment by extremists. Even worse, violence has been aimed at religious critics. The very worst of this involved the murders of the Charlie Hebdo cartoonists. The Charlie Hebdo attacks served as a stark reminder to those of us who believe in freedom of speech just how far people will go to suppress that liberty in the name of religion. There have been cases where non – Muslim commentators, such as Emmanuel Todd, have joined in and partially blamed the Charlie Hebdo cartoonists for the violence and excoriated those who are criticizing Islam. In turn, some secularists have coined the term “Regressive Left” for liberals who they deem to be apologizing for violence and discrimination in the name of Islam. Folks will point out with much truth that these violent fanatics do not represent the Islamic faith. It is absolutely true that most Muslims do not support such things. 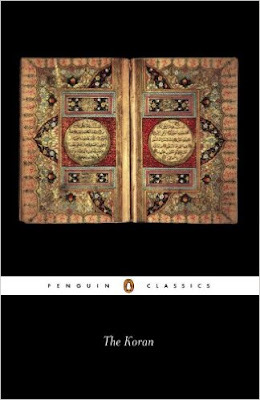 However, the Koran (Since the question comes up when I discuss this topic, I have read the Koran twice), which despite containing a lot of good things is full of racism, misogyny and calls for violence, points to the fact there is some connection. The fact that many of those who perpetuate oppression and violence directly cite the text of this holy book further supports this contention. A popular response to criticism of Islam is that parts of Old Testament advocates terrible barbarities. This is true. Though it seems apparent that it is not driving as much violence and oppression in out current age, belief in certain aspects Old Testament ideology drives some discrimination and violence. Since it is connected to all three Abrahamic Religions, this is particularly significant. This is another good argument as to why it is imperative that people be free to criticize religious belief systems. Though in my opinion the New Testament does not advocate violence and discrimination like other holy books do, it is full of ideas about how people should live. It touches upon morality, human nature, the nature of existence, and even economics. Such a comprehensive set of beliefs also lends itself and must be open to scrutiny. I would also be remiss if I did not mention the positive actions that the various religions as well the texts of the holy books seem to motivate. All the major religions drive an enormous amount of charitable and humanitarian action. With that, such positive aspects of these faith - based systems do not exempt these systems from scrutiny and criticism. However, such activities must be considered when formulating any comprehensive view of these belief systems. Though I have read multiple texts connected with the Eastern religions I am less knowledgeable concerning these belief systems and their impact on humanity. With that, I believe most of the issues and arguments that I raise here also apply to Hinduism, Buddhism, Shintoism, etc. Folks may disagree with some of my opinions on various belief systems. Such disagreement is actually part of the very important discussion that humanity needs to be having about the enormously influential group of ideas known as religion. No doubt religion will always be criticized, in ways that I agree with and in ways that I disagree with. There will also be folks who defend these belief systems. There will be others who insist that religious beliefs are above criticism. I have argued before that a society where folks are free and open to various ideas as well as to criticize these ideas is ideal. I have also mentioned that I am a believer in The Marketplace of Ideas. In such a marketplace, all ideas, including religious ones, must be open to discussion and debate. 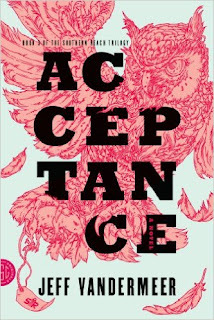 Jeff VanderMeer’s Acceptance is the last book of his Southern Reach Trilogy. My commentary of the first book in the series, Annihilation is here. My commentary on the second book in the series is Authority is here. Told from the points of view of various characters introduced in the previous novels, this last book in the sequence follows three narratives that take place during different time periods. One thread follows events that happened 30 years prior to the action in the first two books. It takes place in the weeks preceding the strange transformation of an area of Florida into what is known as Area X. Saul Evans is an ex-preacher who has become a lighthouse keeper. As the story unfolds, it becomes apparent that Saul, as well as the lighthouse, is an integral part of Area X’s formation and the strange phenomena that occur within its borders. Like most of the main characters of the trilogy, the lighthouse keeper is well fleshed out and complex. Another thread takes place shortly before the beginning of the first book in the series. It centers on an earlier director of Southern Reach, the organization tasked with the investigation of Area X. This director was known as “The Psychologist” in the first book. Here, she investigates the mysteries of Area X both from within and without. She is another well-drawn character. The third story thread involves a trip into Area X by Control and Ghost Bird, the two main characters from book two. As the pair traverses Area X, they encounter monstrous creatures as well as bizarre events. VanderMeer weaves an intricately plotted tale of interconnected characters and events. As the stories unfold, more and more is revealed about Area X as well as the Trilogy characters. In this entry, the usual themes involving ecology and the inscrutability of knowledge and truth are further examined. The end of the book further reinforces some of the ongoing ideas. As it was in the second book, the mood of this novel is varied. The narrative ranges from psychological horror, quirky humor, deep psychological character study and more. Parts of it are written in rare second person narration. This unusual style works well as it adds to a sense of disconnection from reality as well as from perception that has characterized this entire series. At one point, the personality of the Psychologist is filled in using this style. The below use of the word “Your” is by the narrator and not by a character in the book. Ultimately, some of the mysteries involving Area X are solved. VanderMeer does reveal, in very basic terms, what is behind the strange doings in Area X. But many questions, some that seemed to be on the brink of intriguing solutions, remain open. In addition, several of the stories and characters’ fates are left open ended. This fits in well with the themes presented throughout the series regarding the elusiveness of truth. It seems to be representative of our endless search for what is, at times, unattainable knowledge. Though this inconclusiveness gives the ending a thematic unity with what preceded it, I was left partially unsatisfied. The problem is that throughout the series, many enigmas were presented. None of these mysteries seemed unsolvable. To the contrary, solving them would have helped to pull the entire narrative together. Thus, it seems that providing more explanations should have been a necessary ingredient to be included in the series wrap up. Perhaps the themes of the books could have been reinforced in some other way. Based on the intrigue raised in relation to many mysteries that VanderMeer created, more answers here would have made the entire trilogy stronger and more coherent. Despite the lack of more fulfilling answers, this novel is filled with interesting characters and ideas. Like the previous books, the plot is compelling. It is chocked of strange events that kept me very interested. It is a page - turner. With that, I found the first book in the series Annihilation, was the best of the three. The Southern Reach story is unique, creative and meaningful science fiction. There are numerous elements that make these works very distinctive. Despite the fact that the reader is left a bit hanging by the ending, I highly recommend this series. It is refreshingly different in many ways. Fans of strange and enigmatic stories should be very impressed. Those looking for strong characters and for meaning in their fantastical tales will also not be disappointed. These books are well worth reading.